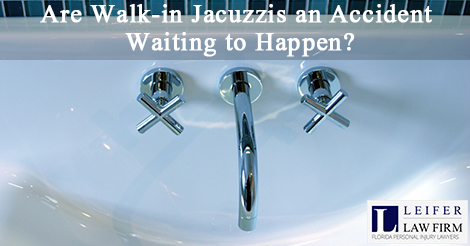 Are Walk-in Jacuzzis an Accident Waiting to Happen? As experienced Boca Raton premises liability attorneys, we often encounter news about the latest trends in home and business construction, and the accidents associated with them. Learn more here about premises liability accidents and how working with a Boca Raton premises liability attorney can help. In many cases, redoing a bathroom is also a necessity. According to the U.S. Administration for Community Living, there will be approximately 98 million Americans ages 65 and older by 2060. Check out this site for more facts on aging statistics in the U.S.
By 2040, seniors will make up nearly a quarter of the population. As the U.S. population continues to age, more people are turning to accessible showers and bathtubs that are easy to enter and exit. Walk-in Jacuzzi tubs are a big part of the trend toward ADA-compliant bathrooms in private residences, nursing homes, and other facilities. Equipped with swinging doors, a low lip, and powerful jets that soothe tired and sore muscles, it’s no surprise walk-in Jacuzzi tubs have grown in popularity. They may look nice and seem to offer options to those with mobility issues, but walk-in Jacuzzi tubs may pose serious risks to consumers, including the elderly. Mobility experts point out that walk-in tubs have a potentially fatal flaw: an inward-opening door. Because many tubs can hold up to 80 gallons of water, they risk trapping an individual in a bath, where he or she can slip, fall and possibly drown. Tragically, drowning deaths in walk-in tubs have already occurred. Recently, the family of a 67-year-old Nevada woman filed a lawsuit against Jacuzzi Brands, installers, and suppliers after she died in a walk-in tub. According to reports surrounding the case, the woman became trapped in her tub, which was equipped with a defective plug. Because she could not drain the water, she could not open the inward-opening door. Friends discovered her body days later. The lawsuit was filed on a number of different negligence theories, including negligent design, negligent manufacture, failure to warn of unreasonable risks, and failure to provide adequate instructions. In February 2015, the U.S. Consumer Product Safety Commission (CPSC) recalled another brand of walk-in tub, stating the tub posed a health and safety risk because its heated seat could get stuck in the on position, creating a fire hazard. Although there have been no injuries or deaths reported in connection with the tub, the CPSC has received 11 reports of defective seats. Learn more about the recall issued by the CPSC here. Has Your Loved One Been Hurt in a Walk-in Jacuzzi or Tub? Many people are surprised to learn that a building or property owner can be held liable for defective or dangerous conditions on their property, including dangerous equipment in bathrooms or other areas—especially in nursing homes. Walk-in Jacuzzi tubs and other appliances and equipment can cost people their health and their lives. In these cases, it is important to hold individuals and entities accountable for injuries that result. Learn more about detecting nursing home abuse here. If you are the caregiver or family member of an elderly loved one, or he or she is in the care of a long-term facility, such as a nursing home, you want the very best care for him or her. You also want justice when an older loved one is hurt or killed or neglected in some fashion. Your premises liability attorney Boca Raton can help you learn more about your case and explain the next steps. Visit here to get started with a Boca Raton premises liability lawyer today.